As many of you know, a couple weeks ago I hit a breaking point. The peace in our home was quickly deminishing. It started with me confessing that I Yell. After deciding to do something about my yelling, my family decided to join in too, by starting our very own Peaceful Home Challenge. The first week did not go as well as we had hoped but it was the first building block. This week, I want to share what we how we have been using a nightly Family Meeting to build a peaceful home, one day at a time. As a preschool teacher, I was introduced to the concept of class meetings. After using them consistently in my classrooms from preschool to first grade, I became a fan. Class Meetings are a time when the entire community comes together to discuss classroom issues and build relationships between your students. It is a time where the teacher is a facilitator and the students are in charge of the discussions and the problem solving. Similar to a class meeting, family meetings are meant to be a starting point for conversations and connections. They are a way to directly teach the skills children (and parents) need to communicate. Over the years, I have tried to bring home the idea of family meetings here and there. My children knew the term and they connected it to a problem in the house. But I was inconsistent. I didn’t follow a format or a set time to do family meeting. Our new routine is to conduct our family meetings at dinner time. They are not the only conversation happening at dinner, but our family meetings take priority after discussing our highlights of our day. For us, nightly works much better as a way to have family meetings even on positive days when the problems are small or something of the past. 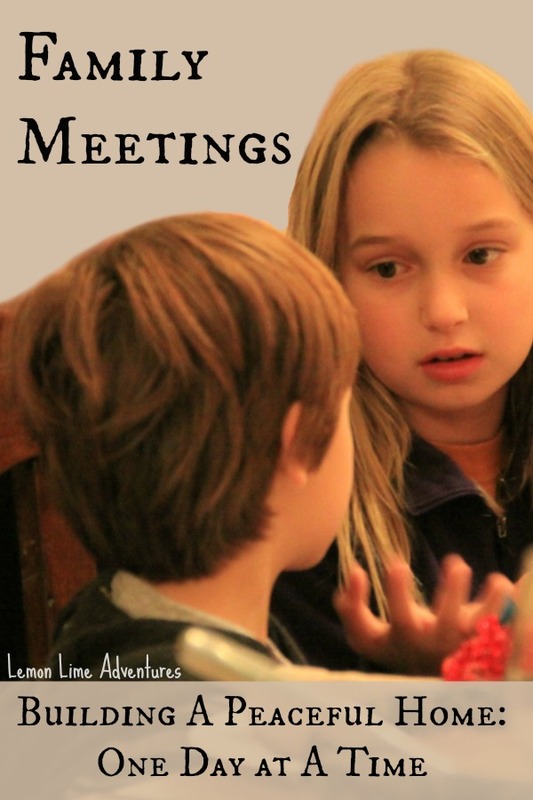 How Do You Get Started With Family Meetings? Getting started can be daunting and scary if you have never set aside specific time for something like this with your family. Like I said, I had introduced the idea to my family over the years but we never followed any format, nor did we have any set guidelines for conducting our meetings. Tip: Don’t expect the “perfect” family meeting at first. Family meetings aren’t magic. The first meeting might not go well. The second might be even worse. You might be ready to give up after the first week. Or, it could be the most beautiful thing your family has ever seen. If you have read about our first week of the challenge, you know that family meetings don’t cure everything, but they are a start. Our first family meeting was very simple. I introduced the idea to the family. Asked for their thoughts and made sure it was something they were interested in. What Does a Family Meeting Look Like? We follow a simple format that works for our family. 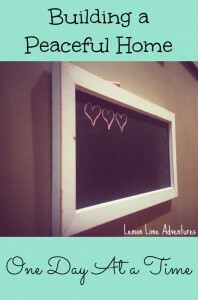 I have included a printable Family Meeting Template that you could laminate and hang on the refrigerator if it would help you get started with family meetings in your home. I ask each person to think of a compliment for someone else in the family. How did someone else help us have a peaceful home? At first, I presented the problems to the family. It was very hard for the boys to come up with this as first. I see us getting upset when…. As time has gone on, the children have gotten better at recognizing problems to bring up. Just last night, Bones said “I think we need to discuss a problem. The other day Legoman said I wasn’t a tiny jerk, but that I was a big jerk.” Yep, that seems like a problem we should discuss. When deciding on solutions, we focus on what “We (the person hurt)” can do the next time the problem happens. The problems are our triggers that might cause us to yell, so we are trying to learn ways to handle our problems without yelling. Talking about solutions to our problems is something we do a lot in our house. Because of Legoman’s explosive personality, we are constantly working to teach all of us ways to deal with our anxieties and frustrations in a better way than exploding. 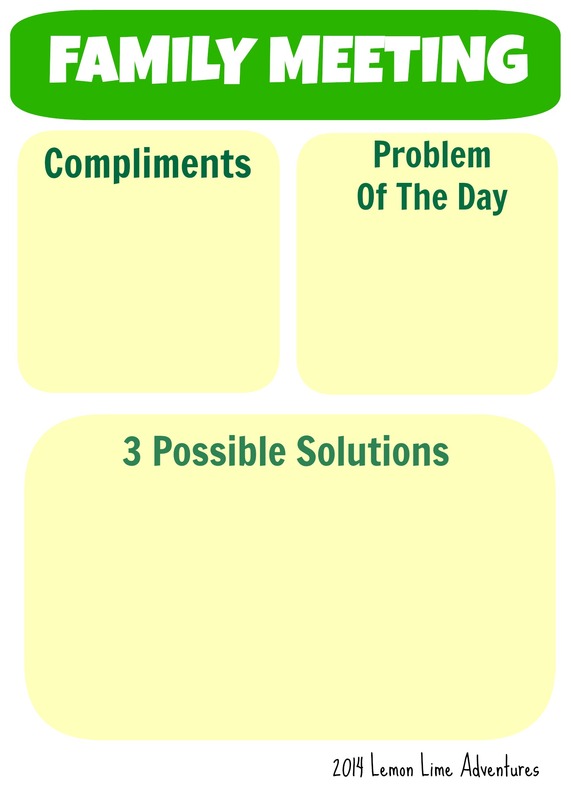 Tip: Problems won’t be solved over night, but now you have a starting point for discussion. This is one of the boys favorite parts of the evening. We pretend like the problem is happening. Each person takes a turn being the one that is hurt and the one being hurtful. This really solidifies what we have talked about, enables the children to take part actively, and make our discussion concrete. This week was a good week, but it wasn’t easy. I was in a funk all week. We were stuck in side and the boys continued to bicker with each other. Most of our days teetered around everyone being at a level 2, but none of us yelled. Not me, not papa, not Legoman, not Bones, not Super B (okay, but she is 9 months old). We are going on our 6th day with No Yelling from anyone in the house, and hoping to make it to our first full week soon. The second building block in our home is our Family Meeting. It is helping us build a peaceful home, one day at a time. How are things feeling in your home? Do you feel a peace or do you feel like there is a struggle going on and you don’t know what to do? How do you help your family remain at peace? I would love to know. Follow along on Facebook, Twitter, Google+, Pinterest, Instagram or subscribe by email. I can’t wait to hear about your peaceful home. Thank you for this great break down of how to start and continue. How old should your children be before you start this with them? I see you act how to react differently, but do you ever address the person that caused the problem and how they should have acted differently? What great questions. I have done this with preschoolers and any age above. The youngest group I did it with was 3 year old in a blended classroom. The younger the children, the more you have to facilitate and the shorter the conversation. We do discuss appropriate behavior when it is happening in the moment. However, I find that by being proactive with understanding the “why” behind what our children are doing is helpful in reducing the behaviors in the first place. They are more aware of their surroundings and more aware of their affect on others. I love this, Dayna! I’ve been brainstorming with my friends and my husband on how to try and change the my children’s natural inclination from one of competition to a spirit of cooperation/support. I mean, competition has it’s place for sure, but we need MUCH more cooperation goin’ on over here :). My best guess is for me to be better about getting everyone to notice and say something like “great job” when their siblings do something well. I’ve been wondering how to get the ball rolling and I think your ideas here are going to work for our family. I’m going to give it a try!! Thank you so much! It hasn’t always been the easiest but it does make for better communication even on the rough days. This is a really logical, and thought out process for helping a family with some tough situations. We need to look at our family too I think, there is too much shouting going on; an about the same things, namely the kids bickering… Thanks for sharing this, we may well be following your lead! Cheers for taking part in the Parenting Pin it Party this week too. It really has changed our family for the better. Not all days are pretty, but they don’t have to be. Today my son was the one that reminded me to calm down so I wouldn’t yell. It was great! That is so fantastic. You just made my day. Thank you for your kind words. I would love to know how this goes when you try it. Our whole family dynamic has changed since we started!